“Jefferson City” redirects here. For other uses, see Jefferson City (disambiguation). Jefferson City is the capital of the U.S. state of Missouri and the county seat of Cole County, even though a small portion of the city extends into Callaway County. It is the principal city of the Jefferson City metropolitan area, which encompasses the entirety of both counties. As of the 2010 census, the population was 43,079 which makes it the 15th largest city in Missouri. Jefferson City was named after Thomas Jefferson, the third president of the United States. Jefferson City is on the northern edge of the Ozark Plateau on the southern side of the Missouri River near the geographic centre of the state, in a region known as Mid-Missouri. It is also at the western edge of one of the major wine-producing regions of the Midwest — the Missouri Rhineland. The city is dominated by the domed Capitol, which rises from a bluff overlooking the Missouri River to the north; Lewis and Clark passed beneath that bluff on their historic expedition upriver before Europeans established any settlement there. In 2013, Jefferson City was named America's "Most Beautiful" Small Town by Rand McNally. In pre-Columbian times, this region was home of an ancient people known only as the Mound Builders. By the time European settlers began arriving, the Mound Builders had vanished. The contemporary indigenous peoples were called the Osage Indians. When the Missouri Territory was organized in 1812, St. Louis was the seat of government. St. Charles next served as the capital. In the middle of the state, Jefferson City was chosen as the new capital in 1821 while Thomas Jefferson was still alive. The village was first called Lohman's Landing. When the legislature decided to relocate there, they proposed the name "Missouriopolis" but later settled on Jefferson City. For years, the village was little more than a trading post located in the wilderness about midway between St. Louis and Kansas City. In 1825 the settlement was incorporated as a city and the next year the Missouri legislature first met there. Jefferson City was selected as the site for a state prison and the Missouri State Penitentiary was opened in 1836. This prison was home to a number of infamous Americans, including former heavyweight champion Sonny Liston, assassin James Earl Ray, and bank robber Charles "Pretty Boy" Floyd. During the American Civil War, Jefferson City was occupied by Union troops and the elected state legislature was driven from Jefferson City by Union General Nathaniel Lyon. Some of the legislators later reconvened in Neosho, MO and passed an ordinance of secession. Missouri was claimed by both the Confederacy and the Union, just like the neighboring state of Kentucky. Missourians were strongly divided and many people in the state, especially in St. Louis, supported the Union, while other areas (such as Missouri's Little Dixie) were strongly pro-Confederate along the Missouri river between Jefferson City and Kansas City. German immigrants created vineyards in small towns on either side of the Missouri River, especially on the north from Jefferson City east to Marthasville, outside St. Louis. Known as the Missouri Rhineland for its vineyards and first established by German immigrants in the mid-19th century, this area has become a part of the agricultural and tourist economy. Jefferson City is located at 38°38′58″N 92°12′52″W﻿ / ﻿38.64944, -92.21444 (38.572954, -92.189283). According to the United States Census Bureau, the city has a total area of 37.58 square miles (97.33 km2), of which, 35.95 square miles (93.11 km2) is land and 1.63 square miles (4.22 km2) is water. Jefferson City has a transitional climate between a humid subtropical and humid continental climate with hot, rainy summers and cold winters. Thunderstorms are common in both the spring and summer and light snow is common during the winter, although about half of wintertime precipitation falls as rain. As of the census of 2010, there were 43,079 people, 17,278 households, and 9,969 families residing in the city. The population density was 1,198.3 inhabitants per square mile (462.7 /km2). There were 18,852 housing units at an average density of 524.4 per square mile (202.5 /km2). The racial makeup of the city was 78.0% White, 16.9% African American, 0.3% Native American, 1.8% Asian, 0.1% Pacific Islander, 0.8% from other races, and 2.2% from two or more races. Hispanic or Latino of any race were 2.6% of the population. In the city the population was spread out with 20.9% of residents under the age of 18, 10.3% between the ages of 18 and 24, 28.6% from 25 to 44, 26.8% from 45 to 64, and 13.4% who were 65 years of age or older. The median age in the city was 37.5 years. The gender makeup of the city was 51.2% male and 48.8% female. The city uses a mayor-council system. The mayor is elected in a citywide vote. The city council has ten members. Two are elected from each of the city's five wards. The Missouri Department of Corrections (MDOC) operates the Jefferson City Correctional Center in Jefferson City. MDOC operated the Missouri State Penitentiary (later named the Jefferson City Correctional Center) in Jefferson City. Before its closure, it was the oldest operating penal facility west of the Mississippi River. It served as the State of Missouri's primary maximum security institution and housed male death row prisoners until April 1989, when they were moved to the Potosi Correctional Center. The current JCCC was opened on September 15, 2004, replacing the Missouri State Penitentiary. The United States Postal Service operates several postal facilities, including the Jefferson City Main Post Office. The major daily English-language newspaper in the area is the Jefferson City News-Tribune. Jefferson City is served by the Jefferson City Public School District, which operates Jefferson City High School, Simonsen 9th Grade Center, Lewis and Clark Middle School, and Thomas Jefferson Middle School, and eleven elementary schools. The district is currently considering to build a second public high school. There are 4 private elementary schools — St. Joseph's, St. Peter, Immaculate Conception, and Trinity Lutheran. Calvary Lutheran, Helias Catholic, and Lighthouse Preparatory Academy are the city's private high schools. Lincoln University is a public historically black university with open enrollment and certificate, associate, bachelor, and graduate programs. Columbia College, State Technical College of Missouri, William Woods University, Metro Business College, and Merrell University also have locations in the city with varying degree levels and options. Jefftran (short for Jefferson City Transit Authority) operates a public bus system year-round. 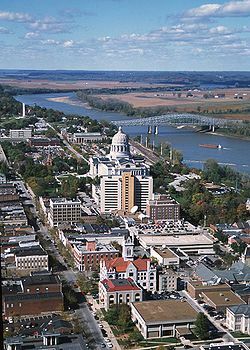 Although Jefferson City is one of the four state capitals that is not served by an Interstate highway, Interstate 70 passes by the city 30 miles (48 km) to the north in Columbia. U.S. highways in the city include U.S. Routes 50, 54, and 63. Missouri Routes 179 and 94 also run through the city, giving it four highways that intersect with I-70. Jefferson City is also home to an Amtrak station and an airport. Mishael Abbott, female race car driver born in Jefferson City. Janet Beecher, actress of stage and screen born in Jefferson City. Alphonso Boone, American pioneer who ran a trading post in Jefferson City. Charlie Brown (running back), former NFL running back born in Jefferson City. Joe Crede, major league baseball player, won 2005 World Series with Chicago White Sox; born in nearby Westphalia. John Daly (golfer), American professional golfer on the PGA Tour. Deborah Digges (born Deborah Sugarbaker), poet; born in Jefferson City. Richard Everett Dorr, former United States federal judge born in Jefferson City. Cedric the Entertainer (Cedric Kyle), actor/comedian; born in Jefferson City. John Farris, author; born in Jefferson City. Arthur Frommer, travel writer, publisher, consumer advocate, and the founder of the Frommer's series of travel guides; born in Jefferson City. Lloyd L. Gaines, plaintiff in Gaines v. Canada (1938), one of the most important court cases in the U.S. civil rights movement in the 1930s; attended Lincoln University. Justin Gage, football player, Tennessee Titans; attended Jefferson City public schools. Patricia A. Goodrich, member of the Wisconsin State Assembly and homemaker; born in Jefferson City. John A. Gordon, former Deputy Director of the Central Intelligence Agency; born in Jefferson City. Tom Henke, major league baseball player, won 1992 World Series with Toronto Blue Jays, also pitched for the St. Louis Cardinals; lives in nearby Taos. Dennis Higgins, former professional pitcher; born in Jefferson City. Chester Himes, author; born in Jefferson City. Joe Jimenez, former American professional golfer best known for winning the 1978 PGA Seniors' Championship; was the club pro at the Jefferson City Country Club. Kent Jones, writer and radio personality; attended Jefferson City public schools. Jack S. Kilby, Nobel Prize-winning inventor and physicist; born in Jefferson City. James Kirkpatrick, former Missouri Secretary of State; former editor of the Jefferson City News-Tribune. Charles Roman Koester, former American Bishop of the Catholic Church; born in Jefferson City. Laura La Varnie, an American actress of the silent era; born in Jefferson City. Sam LeCure, major league baseball player; born near Jefferson City. Stephen R. Leopold, former member of the Wisconsin State Assembly; born in Jefferson City. Steve Martin, football player; attended Jefferson City public schools. William A. Massey, mathematician and operations researcher with expertise in queueing theory; born in Jefferson City. Napoleon McCallum, former running back in the National Football League; born in Jefferson City. Dennis Meyer, former Pittsburgh Steelers football player and coach; born in Jefferson City. Paul Miller, an American basketball player; born in Jefferson City. Maya Moore, college basketball player for the University of Connecticut Huskies; born in Jefferson City and attended Jefferson City public schools prior to moving to Georgia. Richard R. Nacy, former State Treasurer of Missouri; born and raised in Jefferson City. John Opel, former president of IBM; attended Jefferson City public schools. Clint Robinson, professional first baseman with the Los Angeles Dodgers. Steve Rogers, former starting pitcher for the Montreal Expos; born in Jefferson City. William Rose, screenwriter most famous for writing Guess Who's Coming to Dinner; born in Jefferson City. Karl L. Rundberg (1899–1969), Los Angeles City Council member. Rodney W. Sippel, United States federal judge; born in Jefferson City. Justin Smith, football player with the San Francisco 49ers; born and raised in Jefferson City. Sarah Steelman, former State Treasurer of Missouri; born and raised in Jefferson City. Jamaal Tatum, college basketball player for Southern Illinois Salukis; born and raised in Jefferson City. Carl M. Vogel, former member of the Missouri Senate; born and raised in Jefferson City. Harold Volkmer, former member of the United States House of Representatives; born and raised in Jefferson City. Don Webb, former American college and Professional Football defensive back. Keith Weber, former quarterback and pitcher for the University of Missouri. Charlie Weber (actor), film and television actor. Reginald Heber Weller, was an Episcopal priest and bishop active in the ecumenism; born in Jefferson City. Sylvester Williams, an American football defensive tackle for the Denver Broncos; attended Jefferson City High School. Capital Mall - a mall in Jefferson City. ^ "Contact the Mayor." at the Wayback Machine (archived May 7, 2006). City of Jefferson. Retrieved on May 21, 2010. ^ "NowData – NOAA Online Weather Data". National Oceanic and Atmospheric Administration. http://www.nws.noaa.gov/climate/xmacis.php?wfo=lsx. Retrieved 2013-12-08. ^ "Kansas City Daily Climate Records/Normals". National Oceanic and Atmospheric Administration. http://www.nws.noaa.gov/climate/xmacis.php?wfo=lsx. Retrieved December 8, 2013. ^ a b "Jefferson City Correctional Center." at the Wayback Machine (archived May 7, 2006). Missouri Department of Corrections. May 7, 2006. Retrieved on September 18, 2010. ^ "Jefferson City Correctional Center." at the Wayback Machine (archived August 14, 2003). Missouri Department of Corrections. August 14, 2003. Retrieved on September 18, 2010. ^ Lombardi, George, Richard D. Sluder, and Donald Wallace. "The Management of Death-Sentenced Inmates: Issues, Realities, and Innovative Strategies." Missouri Department of Corrections. 8. Retrieved on September 18, 2010. ^ Lombardi, George, Richard D. Sluder, and Donald Wallace. "The Management of Death-Sentenced Inmates: Issues, Realities, and Innovative Strategies." Missouri Department of Corrections. 9. Retrieved on September 18, 2010. ^ "Post Office Location - JEFFERSON CITY." United States Postal Service. Retrieved on September 18, 2010. ^ Staff. "Interstate Highway Fact Sheet" (PDF). American Association of State Highway and Transportation Officials. Archived from the original on October 10, 2008. http://web.archive.org/web/20081010060935/http://www.interstate50th.org/docs/InterstateHighwayFactSheet.pdf. Retrieved February 22, 2012. ^ "James T. Blair, Jr.". Notable Names Data Base. http://www.nndb.com/people/991/000122625/. Retrieved 8 October 2013. ^ "Lorenzo Greene". The University of Houston,. http://www.history.uh.edu/cph/tobearfruit/resources_bios_greene.html. Retrieved 8 October 2013. This page uses content from the English language Wikipedia. The original content was at Jefferson City, Missouri. The list of authors can be seen in the page history. As with this Familypedia wiki, the content of Wikipedia is available under the Creative Commons License.